Buon Natale! Let Mandola's Serve Your Office Party! Mandola’s is proud to offer in-house events and off-site catering for your office party or other holiday event. Make this holiday season one to remember with customizable catering options for groups of all types and sizes. Whether you're planning a December gathering or a New Year celebration, we've got you covered. We use Mama Mandola’s classic recipes to whip up holiday feasts that are sure to please even the most discerning guests. Our mobile brick pizza oven is wood-fired and ready to use for your favorite pizzas, and you can choose from many crowd-pleasing toppings, including prosciutto, pancetta, arugula, and fontina. Our mobile gelato cart also offers a wide selection of seasonal favorites that can be personalized to ensure your guests’ diverse cravings are satisfied. The Mandola’s team is happy to bring the party to you whether you’re hosting in your own place or you’ve got another venue in mind. Our professional staff will be on hand before, during and after the party to get things prepared, to serve your guests and to clean up at the end of the evening. We take care of all the service details for your peace of mind and use chafing sets, serving platters and utensils that won’t detract from your decor. We can also deliver to your event site, including your home or office. We’ll bring your selections ready to serve on disposable trays or pans with disposable serving utensils. We can even provide plates, cutlery, disposable chafing dishes, and other necessities upon request. 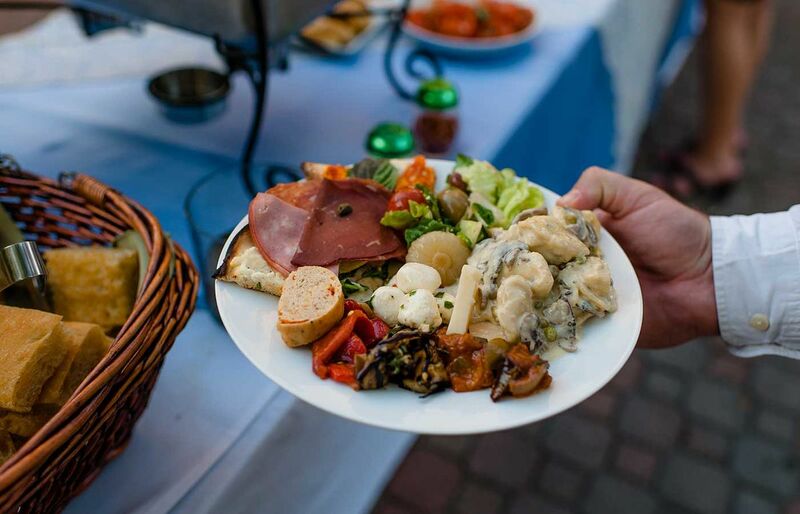 We can bring our top-notch Italian catering services to anywhere in Austin and surrounding areas. In addition, we also accept pickup orders for large groups. We have a full menu of Italian appetizers, salads, pizza, pasta, desserts, and boxed lunches available for carry-out. If you’d prefer to leave all the heavy lifting to the experts, we’ve got you covered. Our fine Italian restaurants offer a variety of spacious and gracious private and semi-private banquet rooms to meet your needs. Our rooms can seat between 25 and 100 people with additional patio seating. Your guests will also appreciate our extensive selection of non-alcoholic beverages and convenient bar service. Whether you’re interested in on-site or off-site Italian catering for your event, we ask that you provide 72 hours notice for us to prepare. We’ll respond to your emails and phone calls within 24 hours. We’re proud to offer some of Austin’s finest Italian meals and desserts, and we look forward to catering your holiday event or office party. Contact Mandola’s to find out more or to get started on planning a party to remember. Buon Natale!